You are here: Home / General News / Facebook launches first app tailored for young users. Facebook launches first app tailored for young users. So on Monday, Facebook launched its first app tailored for young users. It’s a ringfenced network that needs parental approval before use, and will not – the company has promised – be used to feed data for advertising. “Parents are increasingly allowing their children to use tablets and smartphones, but often have questions and concerns about how their kids use them and which apps are appropriate,” said Loren Cheng, product manager for Messenger Kids. If two children want to be friends on Messenger Kids, that friendship has to be approved by a parent for each child. Once confirmed to be safe, friends can do live video chat and send pictures and text to each other. There will also be “a library of kid-appropriate and specially chosen GIFs, frames, stickers, masks and drawing tools lets them decorate content and express their personalities”. Approved adults can also contact children through the app – although they will get their messages through the normal Facebook Messenger app. Messenger Kids will of course collect data: the child’s name, the content of the messages, and typical usage reports for how the app is used. Facebook will share that information with third parties, which must have data protection policies that comply with Coppa, the Children’s Online Privacy Protection Act in the US. Facebook has promised the data will not be used in any way to power the “grown up” Facebook. That’s important – the obvious commercial benefit to this new app might be to target ads to parents based on what their kids are talking about. Or use what was discussed in Messenger Kids to target ads at teens as they graduate into over-13 Facebook. Neither of those things would happen, Facebook said. 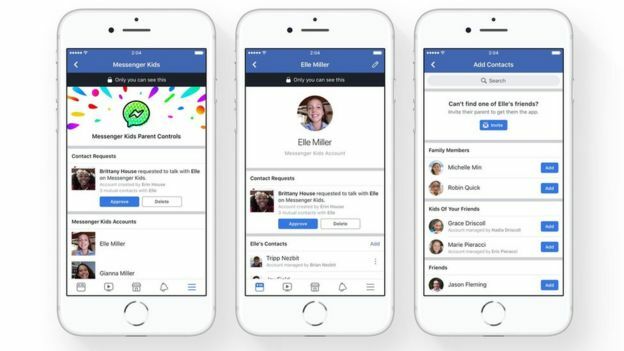 The app doesn’t know specifically how old the children signing up are, so users will not be prompted to move onto Facebook when they are old enough. If a child does decide to join full Facebook, it will be a brand new account with no data carried over from what was said on Messenger Kids. Having youngsters graduate onto Facebook proper is of key strategic importance for the company as it seeks to make sure it is the social network of choice for the next generation of users. If it can capture the attention of 6 to 12-year-olds before Snapchat (or some other competitor) can, then chances are those same kids will naturally progress into using Facebook as teenagers and young adults. It is this demographic causing them the most headaches right now. But business sense aside, you have to ask: should children that young be using social media at all? Sean Parker, one of Facebook’s early investors and its first president, recently opined on the negative impact of the service he helped create. “God only knows what it’s doing to our children’s brains,” he said, reflecting on the small “dopamine hit” we get when someone gives us a “like” on social media. The “like” mechanism is a key part of Messenger Kids – and as a society we might wonder if we want to introduce children as young as six to the concept of online peer validation. Six-year-olds should be playing with worms, not getting FOMO. Others want broader transparency on the various privacy issues that arise from the launch of this app. Facebook’s blogpost on Monday was carefully crafted to alleviate various anticipated worries, and name-dropping experts and agencies that deal with protection of children is a key part of its marketing strategy here. There is tentative support for what Facebook is doing. The prevailing mood is that since kids are using social networks, you might as do what you can to make sure that use is safe and monitored. Common Sense Media, a US non-profit “dedicated to improving the lives of kids and families”, has looked extensively at the proliferation of social media use among young children. “A messenger app for kids under 13 that only parents can sign them up for sounds like a nice idea on its face,” said James Steyer, the organisation’s chief executive. “But without clear policies about data collection, what happens to the content children post, and plans for the future, it is impossible to fully trust the platform. Facebook knows this move into looking after far more vulnerable users will be watched extremely closely. Any harmful content that makes its way onto Messenger Kids will be a major issue for the firm. 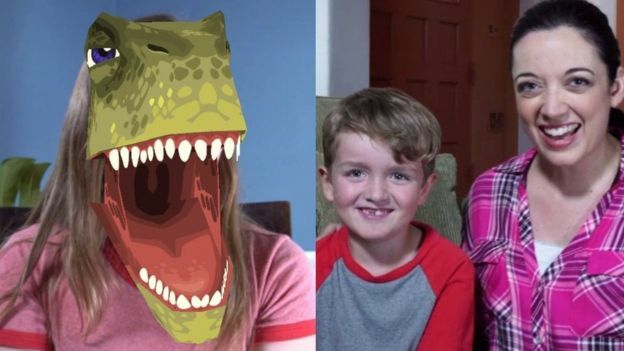 As YouTube found out when disturbing videos found their way onto YouTube Kids, trying to make a child-safe space is difficult – a minority of people will always be looking at ways to get around protections. The app is only available in the US on Apple’s iOS operating system initially.